The past couple of weeks have really got me thinking about the mix of people I spend time with; the people in my classes, socially and professionally. I have been on the road with numerous workshops around the country and hung out with people I do not normally spend time with, which is always fascinating. I love what I do. I love the fact that I get to meet so many people from such varied backgrounds and experiences. I constantly learn from the conversations I have with these individuals, whether those conversations are said out loud, or whether the conversations are silent. What is not said sometimes enriches the experience more that what is said. I have written in the past about choosing who you wish to spend time with, and these couple of weeks have highlighted that even more to me. In one way, or another, I am reminded that it is a choice; that I have the ability and choice to select who I want to surround myself with. 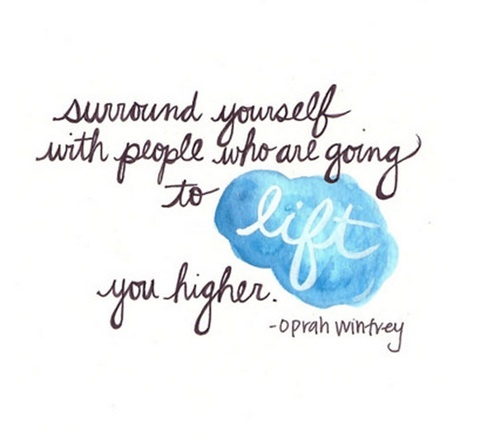 Most definitely I wish to surround myself with people who are going to lift me higher. And yet, it fascinates me when people are given the opportunity to do so, resist, and carry on with their excuses and complaints. Is it fear that holds people back? I know it is very easy to stay within our own comfort zone. And yet, when the situation arises where you are able to spend time with someone you know full well will lift you up, you resist. Is it because people get so caught up with the rat race, the wheel of life, that they just put off taking action? The time will never come. The time will never be right. Ultimately, this is YOUR life. Tell me then, what advice would you give your children if they were in your shoes? Finances?? Where there’s a will, there’s a way. The more I have been talking to people who are interested in teaching My Kind of Yoga, the more I find myself being selective as to who I wish to work with. I have chosen who I wish to surround myself with on a professional/business level. Based on how we run Yoga Chew Valley, we have very lovely members, which make teaching classes a pleasure. So, with growing the My Kind of Yoga Ambassadors, I am looking for people who will form a catalyst collective; yummy people who will lift each others’ energy, support each other and passionate about helping people feel lighter and move with ease. So, what is holding you back from cutting some ties and being more selective about who you hang out with? And by “hanging out”, I mean online, as well as in the flesh.